Despite its numerous beneficial properties, skin is an organ that is often abused and underappreciated by the individual until its compromise results in pain and loss of resistance to infection. Restoration of an intact barrier is of critical importance and may be achieved in numerous ways, including grafting. Among the indications for skin grafting are promotion of accelerated healing of burns and other wounds, reduction of scar contracture, enhancement of cosmesis, reduction of insensible fluid loss, and protection from bacterial invasion. See image below. The skin consists of 2 layers (see image below). The outer layer, or epidermis, is derived from ectoderm, and the thicker inner layer, or dermis, is derived from mesoderm. The epidermis constitutes about 5% of the skin, and the remaining 95% is dermis. The skin varies in thickness depending on anatomic location, gender, and age of the individual. Skin is thickest on the palms and soles of the feet, while the thinnest skin is found on the eyelids and in the postauricular region. Male skin is characteristically thicker than female skin in all anatomic locations. Children have relatively thin skin, but around age 11 years, the skin progressively thickens. This thickening continues until the fourth or fifth decade of life, when the skin begins to thin, primarily due to loss of dermal elastic fibers, epithelial appendages, and ground substance. The epidermis, the more external of the two layers, is a stratified squamous epithelium consisting primarily of keratinocytes in progressive stages of differentiation from deeper to more superficial layers. The epidermis has no blood vessels; thus, it must receive nutrients by diffusion from the underlying dermis through the basement membrane, which separates the 2 layers. The dermis is a more complex structure. It is composed of 2 layers, the more superficial papillary dermis and the deeper reticular dermis. The papillary dermis is thinner, consisting of loose connective tissue that contains capillaries, elastic fibers, reticular fibers, and some collagen. The reticular dermis consists of a thicker layer of dense connective tissue containing larger blood vessels, closely interlaced elastic fibers, and coarse, branching collagen fibers arranged in layers parallel to the surface. The reticular layer also contains fibroblasts, mast cells, nerve endings, lymphatics, and some epidermal appendages. Surrounding the components of the dermis is the gel-like ground substance composed of mucopolysaccharides (primarily hyaluronic acid), chondroitin sulfates, and glycoproteins. Epidermal appendages are important sources of epithelial cells that re-epithelialize when the overlying epithelium is removed or destroyed in patients with partial thickness burns, abrasions, or split-thickness skin graft harvesting. These intradermal epithelial structures, such as sebaceous glands, sweat glands, and hair follicles, are lined with epithelial cells with the potential for division and differentiation. They are found deep within the dermis and in the subcutaneous fat deep to the dermis. This accounts for the remarkable ability of the skin to re-epithelialize even very deep cutaneous wounds that are nearly full-thickness. Sebaceous glands, or holocrine glands, secrete sebum, which serves to lubricate the skin and make it more impervious to moisture. They are found over the entire surface of the body except the palms, soles, and dorsum of the feet. They are largest and most concentrated in the face and scalp where they are the site of origin of acne. Sweat glands, or eccrine glands, are found over the entire surface of the body except the lips, external ear canal, and labia minora. They are most concentrated in the palms and soles of the feet. The normal function of the glands is to produce sweat, which cools the body by evaporation. Apocrine glands are similar in structure but not identical to the eccrine sweat glands. They are concentrated in the axillae and anogenital regions. They probably serve a vestigial sexual function because they produce odor and do not function prior to puberty. 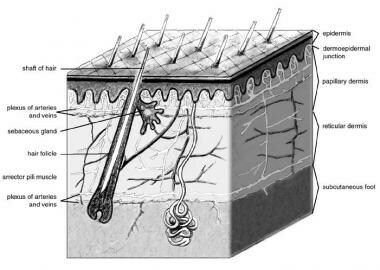 The hair follicle is another important source of epithelial cells, and many of the other epidermal appendages actually open into the hair follicle rather than directly onto the skin surface. The ultimate success of a skin graft, or its "take," depends on nutrient uptake and vascular ingrowth from the recipient bed, which occurs in 3 phases. The first phase takes place during the first 24-48 hours. The graft is initially bound to the recipient site through formation of a fibrin layer and undergoes diffusion of nutrients by capillary action from the recipient bed by a process called plasmatic imbibition. The second phase involves the process of inosculation, in which the donor and recipient end capillaries are aligned and establish a vascular network. Revascularization of the graft is accomplished through those capillaries as well as by ingrowth of new vessels through neovascularization in the third and final phase, which is generally complete within 4-7 days. Reinnervation of skin grafts begins approximately 2-4 weeks after grafting and occurs by ingrowth of nerve fibers from the recipient bed and surrounding tissue. Sensory return is greater in full-thickness grafts because they contain a higher content of neurilemmal sheaths. Similarly, hair follicles may be transferred with a full-thickness graft, which allows the graft to demonstrate the hair growth of the donor site. Split-thickness grafts are ultimately hairless. The amount of dermis present in the graft determines the degree of contraction immediately after harvest from the donor site and following placement and revascularization in the recipient bed. Freshly harvested grafts undergo immediate recoil as a result of elastin in the dermis in a phenomenon termed primary contraction. Therefore, a full-thickness skin graft contracts more initially following harvest as it contains the dermis in its entirety. Secondary contraction is likely due to myofibroblast activity and is defined as the contraction of a healed graft. The degree of secondary contraction is inversely related to the thickness of the skin graft. Early tangential excision of burn wounds is regarded as the standard of care for burns that are not anticipated to heal within 3 weeks. Special considerations in burn excision relate to burns of the face and hands. The aesthetic units of the face should be taken into account during excision, which can often be carried out using a hydrosurgery system such as Versajet (Smith & Nephew, Hull, UK) for superficial partial thickness burns (see image below). When excising burns to the dorsum of the hand, particular care should be taken to avoid injury to the extensor tendons and peritenon to so as to provide a vascularized bed for graft take and preserve maximal postoperative function of the hand. Recipient bed preparation using hydrosurgery system. Meticulous hemostasis of the recipient bed is also key in preventing hematoma formation between the graft and wound bed. Hemostasis is typically achieved through use of epinephrine and saline-soaked gauze, particularly in freshly excised burns, in combination with precise electrocoagulation. Infection also compromises graft survival; therefore, careful preparation of the recipient bed is necessary. A recipient bed that contains a bacteria concentration greater than 105 organisms per gram of tissue will not support a skin graft. Donor site selection is based on multiple factors, including skin color, texture, dermal thickness, vascularity, and anticipated donor site morbidity. Full-thickness grafts taken from the supraclavicular pre- or postauricular areas provide a suitable color match for defects of the face. The pattern for the graft should be enlarged by 3-5% to compensate for the immediate primary contraction that occurs because of the elastin fibers contained in the graft dermis, and the donor site may then be infiltrated with local anesthetic with or without epinephrine. The full-thickness skin graft is excised with a scalpel at the subdermal level of the superficial fat. The residual adipose tissue is subsequently removed with sharp curved scissors prior to placement in the recipient bed, as the fat is poorly vascularized and prevents direct contact between the graft dermis and the wound bed. Donor site defects resulting from full-thickness grafts must be closed primarily or, rarely, with a with a split-thickness graft, since no epithelial structures for regeneration remain. Split-thickness skin grafts are commonly harvested from the thigh, buttocks, abdominal wall, or scalp (see image below). The method of harvesting the split-thickness skin graft depends primarily on the size and thickness needed for coverage of the defect. Smaller grafts can be taken using a "pinch graft" technique using a scalpel blade; slightly larger freehand grafts can be obtained with a Weck blade. Powered dermatomes such as the Zimmer (Zimmer, Inc., Warsaw, Ind) are most commonly used to harvest split-thickness skin grafts, as they have a rapidly oscillating blade that can be set at an adjustable depth and width for appropriate coverage of the defect. Lidocaine with epinephrine may be injected subcutaneously at the donor site prior to harvesting, which aids in reducing blood loss and providing greater tissue turgor to facilitate graft harvest. The planned harvest site and dermatome can be lubricated with mineral oil, sterile saline, or Shur-Clens (ConvaTec, Princeton, NJ) to enable easy gliding of the dermatome over the skin. Epinephrine-soaked gauze may be applied to the donor site immediately following harvest to achieve hemostasis. 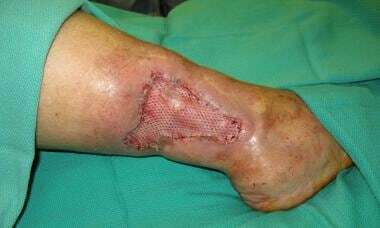 A skin graft may be meshed to provide coverage of a greater surface area at the recipient site, with expansion ratios generally ranging from 1:1 to 6:1. This also allows for the egress of serous or sanguinous fluid; however, it results in a pebbled appearance upon healing that may ultimately be of poorer cosmesis. The first reported use of skin graft mesh expansion was in 1907; modern skin graft meshers were introduced in 1964. [7, 8] Current meshers use one of two methods to mesh the graft. 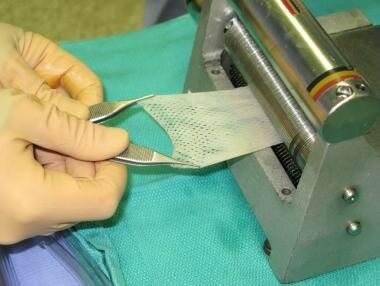 The first method is to use a smooth plastic plate, or carrier, to carry the skin graft under circular notched blades, as used in the Mesh Dermatome (Zimmer, Inc., Warsaw, Ind). The second method does not use a carrier; instead, it uses 2 opposing rollers, and the skin graft is cut as the 2 rollers meet, much like scissor blades cut paper. The Brennen Skin Graft Mesher (Brennen Med, St Paul, Minn) uses this method. Each method of skin meshing has advantages and disadvantages, and their use should be tailored to each clinical application. See image below. Meshing of split-thickness skin graft. 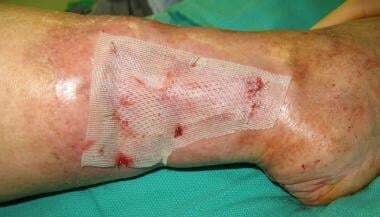 A sheet, or unmeshed, skin graft provides a continuous surface that may be more aesthetically acceptable but does not allow drainage of fluid and requires a greater surface area of harvested graft. A "piecrusting" technique is often employed in sheet or full-thickness grafts, as the creation of small incisions in the graft can allow for drainage without compromising the cosmetic appearance of the healed graft. For large surface area wounds that necessitate coverage with a full-thickness graft, such as the hands or face following burns, tissue expansion can be employed preoperatively to provide adequate surface area for coverage of the defect. One of the more common and expeditious methods of affixing a graft to the recipient site is with surgical staples, particularly to large recipient areas (see image below). In children or in sensitive areas of adults, sewing the graft into place using absorbable sutures may be more prudent. Skin graft affixed to recipient bed using surgical staples. Alternatively, negative pressure dressings (vacuum-assisted closure [VAC]) prevent shearing forces and reduce fluid collection between the graft and recipient bed, thereby facilitating plasmatic imbibition and revascularization, leading to a significant improvement in overall split-thickness skin graft survival. [10, 11, 12] A nonadherent material such as Adaptic (Johnson & Johnson, New Brunswick, NJ) or Conformant 2 (Smith & Nephew, Hull, UK) must be placed as an interface between the skin graft and the VAC sponge to prevent disruption of the graft when removing the dressing. The initial dressing should be left in place for approximately 5 days (3-7 days) unless pain, odor, discharge, or another sign of a complication develops. A hematoma or seroma encountered at the dressing change should be addressed by making a small incision directly over the collection and expressing the underlying contents in order to minimize disruption of graft adherence. See images below. Application of nonadherent dressing to skin graft prior to VAC placement. The split-thickness skin graft donor site epidermis regenerates by secondary epithelialization from the wound edges and from immigration of dermal cells originating in the shafts of hair follicles as well as adnexal structures remaining in the dermis. Although the dermis never regenerates, the same site may be harvested again for subsequent grafts because only a portion is removed in a split-thickness graft. The donor site is not without impaired cosmesis, however, as hypertrophic scar formation or changes in skin pigmentation can occur upon healing. Split-thickness graft donor sites generally heal within 7 days and can be dressed in various ways. An occlusive, semipermeable, polyurethane dressing such as OpSite (Smith & Nephew, Hull, UK) can be applied to the donor site and has the advantage of significantly reducing pain of the donor site in many patients while keeping the wound moist and thereby enabling it to heal faster (see image below). Should the serous fluid production preclude the use of an OpSite dressing, materials such as Xeroform (Kendall, Mansfield, MA) or Acticoat (Smith & Nephew, Hull, UK) may be applied to the donor site and left in place until healed. Donor site dressing with OpSite. The terminology in the literature for skin substitutes and artificial skin is often unclear. In the broadest sense, a skin substitute is anything that substitutes for any of the skin functions. For example, one skin function is to minimize body fluid loss. An impervious dressing such as a polyethylene plastic wrap would minimize evaporation from an open wound and could be considered a skin substitute. In this manner, allografts and xenografts are also skin substitutes. However, to be more than just a dressing, a biologic skin substitute should in some way be incorporated into the healing wound. The ideal skin substitute is nontoxic, has little or no antigenicity, is immunologically compatible, and does not transmit disease. Research and development is currently under way with the hope of providing an ideal durable skin substitute available for use on patients with severe burns and chronic wounds. Although the criterion standard for wound coverage remains the autologous split-thickness skin graft, many products and techniques are available to the surgeon to aid in wound coverage and healing. These skin substitutes function to reduce bacterial count; minimize the loss of water, protein, and electrolytes; restore function; facilitate early motion; and provide coverage of vessels, tendons, and nerves to prevent desiccation. The development of artificial materials or skin grafts grown in the laboratory for skin replacement has been an area of particular interest over the past two decades. As described earlier, the skin is made up of two distinct layers, the epidermis and the dermis. Cultured or artificial dressings, therefore, may be used as a substitute for the epidermal layer, the dermal layer, or both layers simultaneously. Cadaveric grafts and porcine grafts are skin substitutes that have been used clinically for several decades. Cadaveric grafts are termed allografts, or homografts, because they are transplanted from one individual to another within the same species. Pig skin grafts are termed xenografts, or heterografts, because they are transplanted from an organism of one species to that of a different species. These may be prepared for use in several ways. They may be treated with glycerol and rapidly frozen with liquid nitrogen or they may be lyophilized and freeze-dried. Both allografts and xenografts are biologic dressings only, are ultimately rejected by the patient’s immune system, and need to be removed prior to definitive wound treatment or skin grafting. While xenografts are rejected before undergoing revascularization, allografts initially undergo revascularization but are typically rejected after approximately 10 days because of the strong antigenicity of skin. One notable exception occurs in immunocompromised patients, such as burn patients, whose rejection of allografts may be delayed up to several weeks. Xenogeneic tissue such as porcine xenograft can be used as a temporary dressing for clean partial-thickness wounds, such as are incurred with toxic epidermal necrolysis (TEN), and such tissue has been shown to assist in reepithelialization of large defects such as major burns by stimulating granulation tissue formation. Products such as Permacol (Tissue Science Laboratories, Hampshire, UK) include modifications to porcine xenograft that extend the lifespan and microbial resistance of the graft. The patient's own epithelial cells may be harvested and grown in culture for use as a larger epidermal autograft, in a technique that has been applied for over 20 years. These autografts address the epidermal layer only and are typically quite thin. Cultured epidermal autografts (CEAs), such as Epicel (Genzyme Biosurgery, Cambridge, Mass) and Laserskin (Fidia Advanced Biopolymers, Abano Terme, Italy), use a biopsy from the patient that is expanded via culture techniques in the laboratory setting to produce a sheet of autogenous keratinocytes for grafting. While CEA can ideally provide coverage of a large surface area defect using a small amount of donor tissue, this type of skin substitute has been associated with high rates of infection and graft loss, confirming the importance of the dermal layer in skin grafting. Cultured skin substitute (CSS) is composed of a CEA combined with a cultured autologous dermal layer;  therefore, it addresses both the dermal and epidermal skin layers. This provides a more biologically similar material for skin replacement. The production of an effective replacement material for the dermis has proved more challenging given the complexity of the dermal structure, although several materials have well-documented success in this capacity. Substitute materials are classified based on their epidermal, dermal, or composite structure, and are further categorized by composition as acellular or cellular, and living or nonliving. Newer acellular dermal allografts include Strattice (LifeCell, Branchburg, NJ), SurgiMend (TEI Biosciences, Boston, Mass), GraftJacket (Wright Medical Technologies, Inc, Arlington, Tenn), NeoForm (Mentor Corporation, Santa Barbara, Calif), and DermaMatrix (Synthes, Inc, West Chester, Penn), which have been studied for applications such as lower extremity, craniofacial, and breast reconstruction. Integra (Integra Life Sciences Corp, Plainsboro, NJ) is an acellular dermal regeneration template that became commercially available in 1996. It is a bilaminate membrane consisting of a porous collagen layer (dermal analogue) bonded to a thin silicone layer (temporary epidermis). The dermal layer becomes revascularized and populated by cells from the patient’s own underlying tissue over 7-21 days. Once this process is complete, an ultrathin split-thickness skin graft, or epidermal autograft, must be placed over the new dermis after removal of the silicone layer from the new dermal layer. These dermal substitutes have been extensively studied for coverage of partial and full-thickness defects and can be permanently incorporated into the patient’s new skin layers without being rejected by the patient’s immune system. They also carry the advantages of immediate availability, avoidance of the risks associated with cellular allogeneic materials, the use of thinner split-thickness skin grafts, reduced donor site morbidity, and improved overall split-thickness skin graft incorporation. Several synthetic skin substitutes have become available for temporary wound coverage in preparation for definitive wound coverage. Cellular dermal allografts are composed of a collagen or polymer-based scaffold that is seeded with fibroblasts from a donor cadaver. These products, including ICX-SKN (Intercytex Ltd, Manchester, UK), TransCyte, and Dermagraft, have reported use in coverage of partial- and full-thickness wounds. TransCyte (Advanced Tissue Sciences, Inc., La Jolla, Calif) is a nylon mesh incubated with human fibroblasts that provides a partial dermal matrix with an outer silicone layer as a temporary epidermis. It is indicated for use in deep partial or excised full-thickness wounds prior to autogenous skin graft placement. It must be removed or excised prior to grafting full-thickness wounds. Dermagraft (Advanced Tissue Sciences, Inc., La Jolla, Calif) consists of human neonatal fibroblasts cultured on Biobrane. The neonatal fibroblasts are seeded into the nylon mesh. Approximately two weeks after application, the silicone membrane is removed and the wound bed grafted with a split-thickness skin graft. Dermagraft is a dressing and does not provide full dermal scaffolding, thus requiring standard depth split-thickness skin grafts. Composite allografts are bilayer products such as Apligraf (Organogenesis, Inc., Canton, Mass), which has a dermal component comprised of bovine collagen and neonatal fibroblasts combined with an epidermal layer formed by neonatal keratinocytes, and Orcel (Ortec International, Inc., New York, NY), which consists of a bovine collagen sponge coated with neonatal allogeneic keratinocytes. As allogeneic material, however, they cannot be used as permanent skin substitutes, as they will be rejected by the patient’s immune system. These materials have primarily been used in the treatment of chronic wounds and donor sites. They also have reported utility when used as an overlay dressing on split-thickness skin grafts to improve function and cosmesis. Skin grafting remains an important step on the surgeon's reconstructive ladder. While the basic premises have remained the same for many years, the development of new techniques and devices has contributed to significantly improved functional and aesthetic results. The development of skin substitutes, along with stem cell therapies [24, 25] and tissue engineering, [26, 27, 28] offer promising advances for this field in the future. Gottschlich M.M. Fat-Soluble Vitamins and Wound Healing. Molnar, J.A. Nutrition and Wound Healing. Boca Raton: CRC Press; 2007. 156. Siemionow M, Nasir S. Immunologic responses in vascularized and nonvascularized skin allografts. J Recon Microsurg. 2008. 24:497-505. [Medline]. Harrison CA, MacNeil S. The mechanism of skin graft contraction: An update on current research and potential future therapies. Burns. 2008. 34:153-163. [Medline]. Callcut RA, Schurr MJ, Sloan M, et al. Clinical experience with Alloderm: a one-staged composite dermal/epidermal replacement utilizing processed cadaver dermis and thin autografts. Burns. 2006 Aug. 32(5):583-8. [Medline]. Molnar JA, DeFranzo AJ, Hadaegh A, et al. Acceleration of Integra incorporation in complex tissue defects with subatmospheric pressure. Plast Reconstr Surg. 2004 Apr 15. 113(5):1339-46. [Medline]. Choi M, Panthaki ZJ. Tangential excision of burn wounds. J Craniofac Surg. 2008. 19:1056-60. [Medline]. Vandeput J, Nelissen M, Tanner JC, et al. A review of skin meshers. Burns. 1995 Aug. 21(5):364-70. [Medline]. Taghizadeh R, Gilbert PM. Comparison of commonly used mesher types in burns surgery revisited. Burns. 2008 Feb. 34(1):109-10. [Medline]. Cox GW, Griswold JA. Outpatient skin grafting of extremity burn wounds with the use of Unna Boot compression dressings. J Burn Care Rehabil. 1993 Jul-Aug. 14(4):455-7. [Medline]. Schneider AM, Morykwas MJ, Argenta LC. A new and reliable method of securing skin grafts to the difficult recipient bed. Plast Reconstr Surg. 1998 Sep. 102(4):1195-8. [Medline]. Llanos S, Danilla S, Barraza C, et al. Effectiveness of negative pressure closure in the integration of split thickness skin grafts: a randomized, double-masked, controlled trial. Ann Surg. 2006 Nov. 244(5):700-5. [Medline]. Gupta S. Optimal use of negative pressure wound therapy for skin grafts. Int Wound J. Aug 2012. 9(1):40-7. [Medline]. Sinha S, Schreiner AJ, Biernaskie J, Nickerson D, Gabriel VA. Treating pain on skin graft donor sites: review and clinical recommendations. J Trauma Acute Care Surg. 2017 Nov. 83 (5):954-64. [Medline]. Ottomann C, Hartmann B, Tyler J, Maier H, Thiele R, Schaden W, et al. Prospective randomized trial of accelerated re-epithelization of skin graft donor sites using extracorporeal shock wave therapy. J Am Coll Surg. 2010 Sep. 211(3):361-7. [Medline]. Karlsson M, Elmasry M, Steinvall I, Sjoberg F, Olofsson P, Thorfinn J. Scarring At Donor Sites After Split-Thickness Skin Graft: A Prospective, Longitudinal, Randomized Trial. Adv Skin Wound Care. 2018 Apr. 31 (4):183-8. [Medline]. Felder JM 3rd, Goyal SS, Attinger CE. A systematic review of skin substitutes for foot ulcers. Plast Reconstr Surg. Jul 2012. 130(1):145-64. [Medline]. Dixit S, Baganizi DR, Sahu R, et al. Immunological challenges associated with artificial skin grafts: available solutions and stem cells in future design of synthetic skin. J Biol Eng. 2017. 11:49. [Medline]. [Full Text]. Bettex-Galland M, Slongo T, Hunziker T, et al. Use of cultured keratinocytes in the treatment of severe burns. Z Kinderchir. 1988 Jun. 43(3):224-8. [Medline]. Boyce ST, Goretsky MJ, Greenhalgh DG, et al. Comparative assessment of cultured skin substitutes and native skin autograft for treatment of full-thickness burns. Ann Surg. 1995 Dec. 222(6):743-52. [Medline]. Tchero H, Herlin C, Bekara F, Kangambega P, Sergiu F, Teot L. Failure rates of artificial dermis products in treatment of diabetic foot ulcer: A systematic review and network meta-analysis. Wound Repair Regen. 2017 Aug. 25 (4):691-6. [Medline]. Jung SN, Chung JW, Yim YM, et al. One-stage skin grafting of the exposed skull with acellular human dermis (AlloDerm). J Craniofac Surg. 2008. 19:1660-62. [Medline]. Min JH, Yun IS, Lew DH, et al. The use of Matriderm and autologous skin graft in the treatment of full thickness skin defects. Arch Plast Surg. 2014 Jul. 41(4):330-6. [Medline]. [Full Text]. Whitaker IS, Prowse S, Potokar TS. A critical evaluation of the use of Biobrane as a biologic skin substitute. Ann Plast Surg. 2008. 60:333-37. [Medline]. Lewis CJ. Stem cell application in acute burn care and reconstruction. J Wound Care. Jan 2013. 22(1):6-12. [Medline]. Akita S, Yoshimoto H, Akino K, Ohtsuru A, Hayashida K, Hirano A, et al. Early experiences with stem cells in treating chronic wounds. Clin Plast Surg. Jul 2012. 39(3):281-92. [Medline]. Wong VW, Gurtner GC. Tissue engineering for the management of chronic wounds: current concepts and future perspectives. Exp Dermatol. Oct 2012. 21(10):729-34. [Medline]. Wood F. Tissue engineering of skin. Clin Plast Surg. Jan 2012. 39(1):21-32. [Medline]. Horch RE, Kneser U, Polykandriotis E, Schmidt VJ, Sun J, Arkudas A. Tissue engineering and regenerative medicine - where do we stand?. J Cell Mol Med. Jun 2012. 16(6):1157-65. [Medline]. The authors and editors of Medscape Reference gratefully acknowledge the contributions of previous authors Don R Revis Jr, MD, and Michael Brent Seagle, MD, to the development and writing of this article.